Much has been written about the time Hitler spent as a young man in Vienna. The most reliable source on this time is the Hitler biography of Volker Ullrich: Adolf Hitler. Biographie. Band 1. Die Jahre des Aufstiegs 1889-1939 (2013). He waded trough all available material, and sorted out the facts from the ocean of documents, stories and concoctions. See also: Jaap van den Born & Bart FM Droog. Hitler biographies. Bloemen van het kwaad. Droog Magazine, 2017. 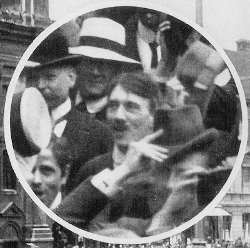 Early September 1907 Hitler travels to Vienna, to do entrance examinations for the 'Akademie für Bildende Künste' (Academy of Fine Arts). He is one of 112 candidates. He passes the first examination, but fails for the second. Only 28 candidates succeed for this second examination.³ The judgement of the exam commission: "Few heads, test drawing insufficient." Hitler spends his days reading, making architectural sketches, going to the Opera, holding long monologues to Kubizek - basically living the live of a bohemien, but without heavy drinking and without chasing women (or men). Until the 20th of August 1909 Hitler lives in the Felberstrasse. Nothing is known about Hitlers activities in this period. From this point until his registration in the Männerheim at the Meldemannstrasse, February 1910, there's no documentary evidence of where Hitler stayed. Most biographers, including Volker Ullrich, tell that Hitler was for a while homeless and found shelter in the Meidlinger Obdachlosenasyl. Their source: Reinhold Hanisch. 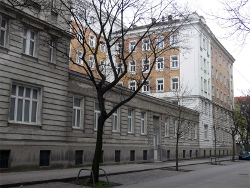 The Viennese historian Anna Maria Sigmund has another story: according to her Hitler probably lived from 16 September until November 1909 as a subtenant in a house at Simon Denk Gasse 11 (IX District, Vienna), and then, again as a subtenant, at Humboldtgasse 36 (X District, Vienna). Her source are pictures (in the Austrian National Library images archive)n dating from after the Anschluss, 1938, with subscriptions. One is a the picture of the Humboldtgasse on which is also stated that the house was now (in 1938) marked with a garland, to commemorate the former resident. Asyl für Obdachlose, Unter Meidlinger Strasse, Vienna. Built 1908. Buchhändler, CC BY-SA 3.0, 2007. If it's true what Hanisch - not a very reliable witness - describes, then Hitler had been living rough for only a couple of days - not months, as sometimes is suggested. "The stereotyped description of the notorious liar Reinhold Hanisch is absurd and contradictory, leaves many questions unanswered and does not stand up to critical analysis. Was Hitler, in spite of an orphan's pension and loans, so starved that he was grateful for a piece of bread? Although bread in the asylum was distributed free and in sufficient quantity! Of course, we don't know where the two met, nor even when exactly. But it must have been somehere in Vienna, end 1909/begin 1910. On 9th of February 1910 Hitler and Hanisch, by then business partners, moved to the Männerheim at Meldemannstrasse 27. 2. Hitler said he knew Hanisch from the homeless shelter in the Meidlinger Strasse - where he saw him once. Hitler didn't say he had lived there himself. From then on Hitler acts as his own agent; he sells his watercolors to a number of Viennese framemakers. Hitler spent much of his time reading, drawing architectural sketches, discussing and painting - albeit not that many watercolors as postwar art swindlers claimed. How much watercolors he painted in his Viennese time remains a bit of a mystery, however. As Altenberg (Wiedner Hauptstrasse/Favoritenstrasse) was the most important off all known four framemakers who had bought watercolors from Hitler, one could deduce that he painted less than 100 in his Viennese days - apart from small watercolors on postcards, which he might have painted in 1909 and early 1910. 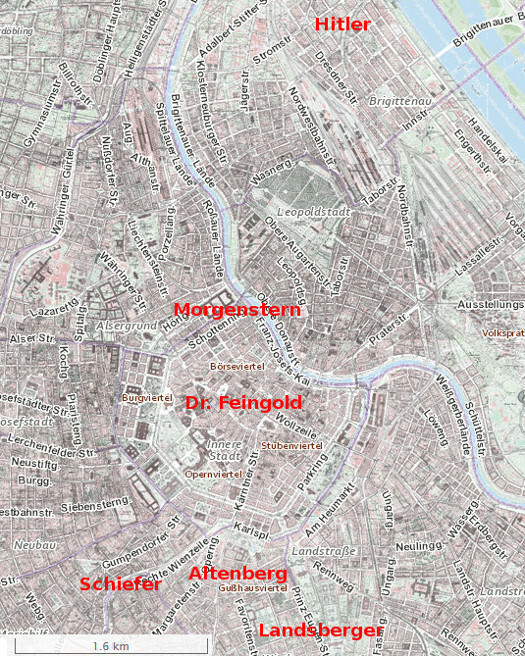 The other framemakers were: the jewish Josef Landsberger (Favoritenstrasse 70) and Samuel Morgenstern (Liechtensteinstrasse 4) who had bought at least six watercolors)16 and the christian Johann Schiefer (at Schönbrunnerstrasse 14). On reaching the age of 24 Hitler received 819 kroner from the inheritance of his father. He moves on May 25 1913 to Munich. 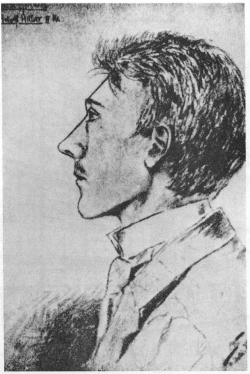 He's not alone - 20 year old drugstore apprentice Rudolf Häusler, who came to live in the Männerheim in February 1913, accompanies him. They rent a room at Schleissheimer Strasse 34 in Munich. In the Bavarian capital Hitler spends his time by visiting musea, hanging around in coffee bars and painting - according to Ullrich one painting every two or three days, mostly copies from postcards of well known Munich buildings. But Ullrich also states that Hitler continued his rather lazy Viennese lifestyle in Munich20 - which would indicate that Hitler was in Munich not more productive as a painter than in Vienna. If this number of paintings provided by Ullrich is correct that would mean that Hitler painted some 100 to 150 watercolors in one year in Munich, as opposed to some 100 in three years in Vienna. We think Ullrich's estimate is too high - a better estimate would be: less than 50 in his Munich period. Hitler sold in Munich his watercolors to stores and at beer gardens. In 1938-1939 the NSDAP Hauparchive tried to register these works - it is unknown what percentage this organization did trace. Then, the First World War breaks out. Hitler is one of the many who volunteer. Page 687, note 42. 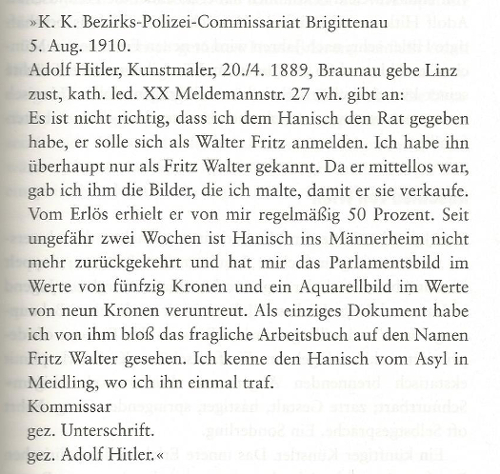 Ein zuverlässiger Bericht eines Mitbewohners aus dem Männerwohnheim, wo Hitler zwischen Februar 1910 und Mai 1913 logierte, schreibt Hitler eine Tagesproduktion von etwa einem Aquarell zu, Bericht von Karl Honisch an den Leiter des NS-Parteiarchivs, 12. Mai 1939, BA Berlin, NS 26/17a, wörtlich abgedruckt bei Joachimsthaler. Hitlers Weg, S. 52-59, hier S. 55. Marc Lambert, Un peintre nommé Hitler, Paris 1986, S. 84f., geht davon aus, dass Hitler nicht täglich zeichnete und auch nicht alle angefertigte Aquarelle am selben Tag absetzen konnte, daher kommt er zur Einschätzung von etwa 700 Aquarellen aus der Wiener Zeit. It's our feeling that the statement of Honisch, who lived in the Männerheim in 1913 (and we don't know from which date exactly) is of little value: Hitler left the Männerheim in the end of May, 1913.So Honisch, if he had known Hitler at all, only witnessed him for five months at the most. As this French author's estimation is based on the statement of Honisch, then that estimation is of little value too. ¹ Volker Ullrich, Adolf Hitler. Biographie. Band 1. Die Jahre des Aufstiegs 1889-1939. Fischer, 2013. p. 38-39. ² Picture from: August Kubizek. Adolf Hitler, mein Jugendfreund. Stocker, Graz/Göttingen, 1953. 352 p. 6th edition. 4 Konrad Heiden. 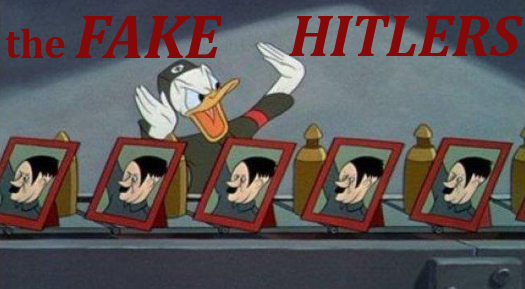 Adolf Hitler. Das Zeitalter der verantwortungslosigkeit. Ein Mann gegen Europa. Europaverlag, [Berlin/München/Zürich/Wien], . Page 66. New edition; originally printed in 1936-1937. Written in 1935. 5 Adolf Hitler, Mein Kampf, page 19. "Geschlagen verliess ich den hansenschen Prachtbau am Schillerplatz, zum Ersten Male in meinem jungen Leben uneins mit mir selber." 8 Ullrich, page 41. "Gemeinsam mit seiner Schwester Paula beantragte er bei der linzer Finanzlandesdirektion die waisenrente - ihnen stand ein monatlicher Betrag von 50 Kronen, 25 für jeden, zu. Das väterliche Erbe von jeweils 652 kronen war auf ein Sperrkonto bis zum 24. Lebensjahr festgelegt, aber über den mütterlichen Erbanteil von rund 2000 Kronen konnten die beiden bereits verfügen. Hitler war damit keineswegs, wie behauptet worden ist, vermögend geworden, aber er konnte mit dem Geld doch ganz gut für ein Jahr in Wien über die runden kommen, ohne einer geregelten Arbeit nachgehen zu müssen." 9 Ullrich, p. 45, 51. 11a Anna Maria Sigmund. Wiener Zeitung, 26-02-2010. William L. Shirer. The rise and fall of the Third Reich. A history of Nazi Germany. Secker and Warburg, London, 1960. Page 37. 12 Reinhold Hanisch. 'I was Hitler's buddy'. The New Republic, 1939. Page 239. 12a Anna Maria Sigmund. Wiener Zeitung, 26-02-2010. 14 Ullrich p. 53-54, 60. 14a Ian Kershaw. Hitler. 1889-1936: hubris. W.W. Norton & Company, New York/London, 1998. Edition used: Norton paperback 200. Page 55. 16 J. Sydney Jones, Hitler in Vienna, 1983. P. 320, note 39. 17 Hitler als Aquarellmaler. Österreichisches Abendblatt, 05-07-1933. 18 Adolph Lehmann's Allgemeiner Wohnungs-Anzeiger 1859-1922 [-1942]. Editions 1911 and 1913.